This is an old family recipe. My Grandmother would make these special treats for us and this is the way she made them. You will love 'em. Toast sesame seeds, if needed, by placing in a dry pan and toasting on low heat until fragrant and lightly toasted. In a large mixing bowl, add the flours, baking powder, sugar, anise seeds and sesame seeds. Mix well. Add the canola oil, olive oil and water. Mix with a wooden spoon until a dough forms, changing to mixing with you hands when you can no longer mix with the spoon. 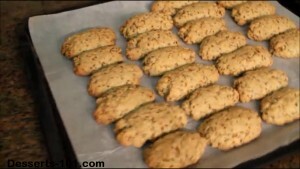 To form the cookies, grab a piece of dough about the size of a walnut and roll like a meatball then shape into a cigar. Place the cookie on a wire mesh sieve (or screen) and flatten with 3 fingers then pull toward you to start the cooking rolling up. When you can no longer roll the cookie, lift the front end over and continue to roll into a pipe with a hallow center. Place on a parchment paper lined baking sheet. Bake in a preheated 350ºF/177ºF oven for 20-30 minutes or until the edges and sides start to lightly brown. Cool before eating. Store in an air tight container.